Here's a dirty little secret. I've mentioned it before and I'll mention it again. We use a swell bridle on our catamaran. I know, I know. We aren't supposed to roll! Our glasses of Bordeaux (in actual glass) shouldn't tip over! At anchor and on a mooring, the boat should face into the wind. However, if the waves are different from the wind, then we rock side to side. "Where's the Dramamine?" 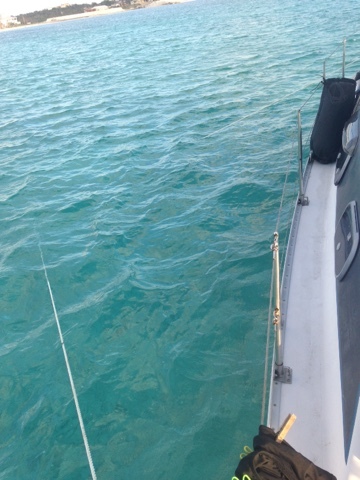 There's nothing worse than being seasick at anchor. 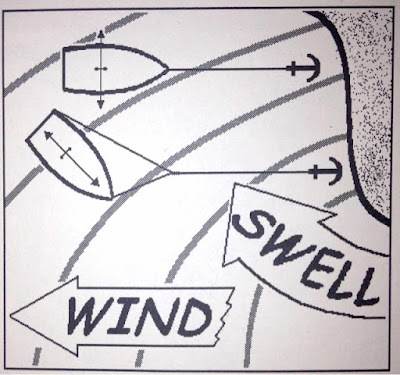 And of course, the different sound (waves slapping the side of the hulls) keeps us awake--if you can sleep thinking about what this is doing to your anchor. We've used it in Turks and Caicos, on the mooring ball in Statia (WHAT?!) and used it most of the stay in Simpson Bay, Sint Maarten. In fact the crew of the Leopard anchored behind us did a slow pass each day, trying to figure out why were were sideways to them. 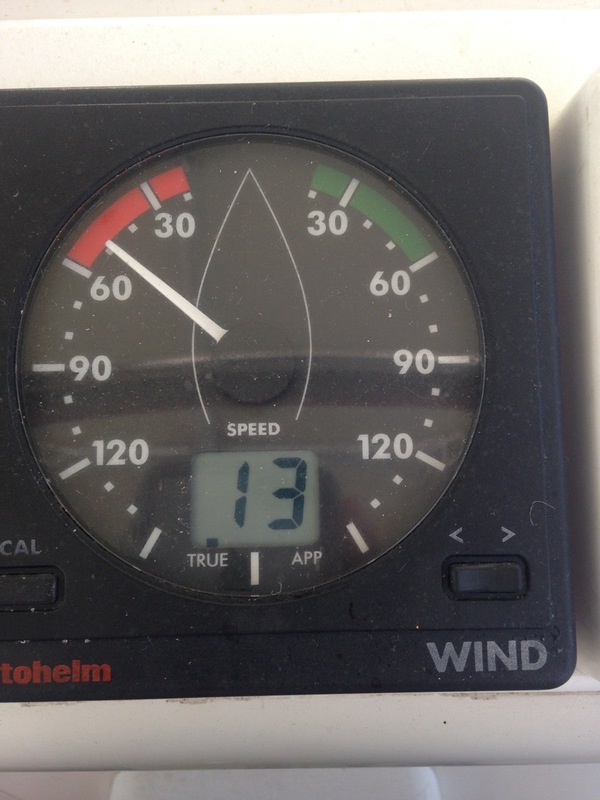 The crew of a fellow PDQ 36 Minuet came straight over after putting out a stern anchor, and said, "What the heck?" The Gentleman's Guide to Passages South, The Thornless Path to Windward by Bruce Van Sant, pg 133, "Swell Bridle. Rum Cay lets you demonstrate a swell bridle to those fortunate sailors who never needed one in their home waters. From Georgetown to Luperon, and at odd points south, you shall anchor in open harbors where swell can sweep around the points. If roll annoys you, don't dash out into a full gale to avoid it, but fetch a boat's length of line and tie a rolling hitch to your rode at the bow. Cleat off the other end to your stern, then let out scope until you face the swell. Now you shall pitch a bit instead of rolling. You may also need some vernier adjustment to the stern." We can use our current bridle set up one of two ways. According to Beth Leonard's, The Voyaging Handbook, "...one side of the bridle can be shortened to bring the boat into a more comfortable alignment with the waves". In more extreme conditions (ie. monohull friends left on overnight sail to get out of rolly, rolly, puke, puke), we leave one side of the bridle on the bow cleat and walk the other side of the bridle back to a stern cleat (or rolling hitch back to an aft winch). We personally find 45 to the wind and waves the most comfortable. 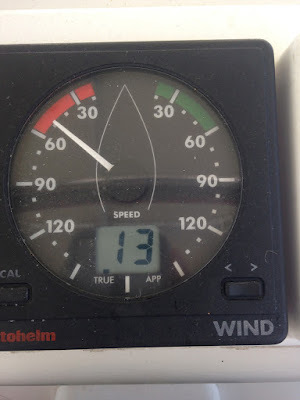 However, this may reduce the breeze coming in the hatches, the rigging may vibrate (or "hum"), and it will confuse the heck out of other boaters as they arrive in the anchorage! Only had to do this twice, but when you need it, it makes ALL the difference. You are a good instructor.